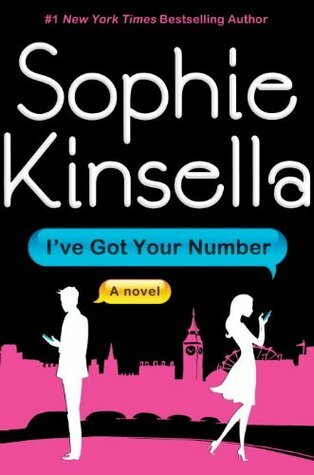 Sophie Kinsella strikes again with I’ve Got Your Number! I’ve always been a fan of Sophie Kinsella’s books since I was in high school and now that I’m an adult in my early twenties I still am. There’s just something about the way she writes her novels that I can’t seem to find in other books. This book is not an exception at all. The novel’s main protagonists are Poppy Wyatt and Sam Roxton. I love this novel as much as I loved her Shopaholic series, which by the way is my favorite chick lit series of all time. Seriously, I have two copies of the books since most of my copies are either battered or MIA already. A friend of mine borrowed some of the books and refused to give it back. Pfft. Anyhoo, the first few chapters made me laugh so much I ended up reading it in one day. What I love about this book? hmm. Honestly, I don’t really know why but it’s probably because I fell in love with the characters and the story itself. First there’s Poppy. Poppy somehow reminds me of Becky Bloomwood minus the shopaholic part. I adore Poppy. She’s funny and witty and everything that you could ever ask for in a chick lit heroine. Seriously, she made me laugh so much from the get-go. I think her only flaw is the fact that she wanted everyone to like her even if it meant compromising her beliefs and standards. Oh well, I guess that’s what makes her believable as a character. She’s human and her flaws make her a real person in my opinion. Then of course, Ms. Kinsella’s novel would not be complete without the almost-perfect-male-protagonist Sam Roxton. I love Sam because he reminds me of Luke Brandon from the Shopaholic series. Oh for crying out loud this book somehow reminds me of the Shopaholic novel series and I honestly loved that series. haha. He’s not a CEO per se but he is definitely one of the “Big Guns” in their company. I’m not even sure what his position in the company is. All I know is he’s one of the big shots and that’s it. Cut me some slack though, I’m not a company person, I work in a hospital and I’m not sure about the hierarchy in the corporate world. Anyway, I just love the way Sam Roxton’s character was written. He was witty, funny, hot and everything that a girl could ever wish for. Another book boyfriend as one might say. Yes, he’s flawed and everything but that’s what makes him more believable and lovable for me. Overall, I loved this novel. It made me laugh and feel giddy at the same time. I love the fact that that this reminded me so much of the Shopaholic series. I know the “important corporate guy-ordinary girl” formula has been used by Ms. Kinsella a gazillion times already but somehow she still knows how to make it refreshing for her audience. She has not lost her touch as one might say. Her side characters were amazing as well. I love the fact that she made Wanda and Antony seem so mean and evil but in the end made them oh so adorable. I also love Felix and Ruby. Both are so innocent in their own ways. I wanted to smack Annalise during the first few chapters but Magnus tops my list of Annoying Character of the Book. I seriously wanted to throw this guy in the ditch. I also love her references to Google and the popular Magnum ice cream today. Anyhoo, I’d give this book a 5/5 star rating just because it’s Sophie’s book. Haha. Kidding! I love this book it made me laugh, cry and feel giddy all at the same time. Recommending this to chick lit and Sophie Kinsella lovers.